Our most affordable high-density system. 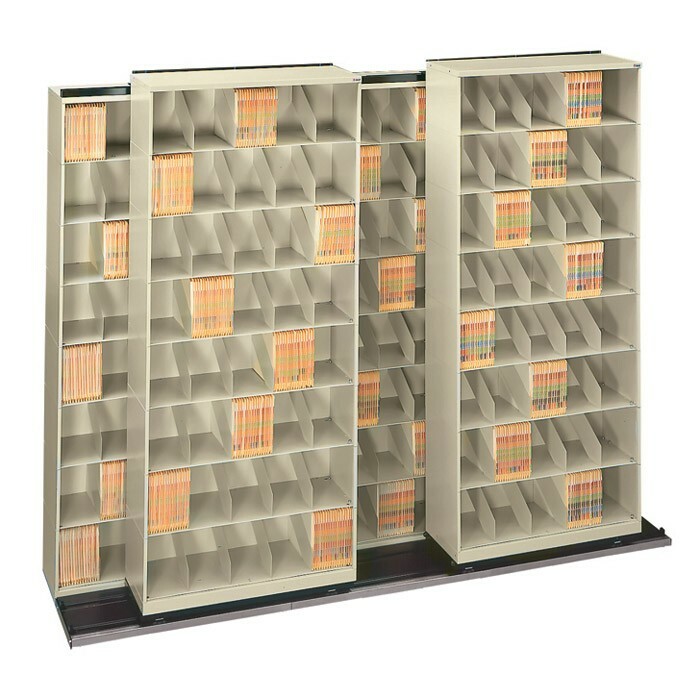 Movable-lateral systems consist of stationary shelving in the back row and movable shelving in the front row. The movable shelving units are mounted to mobile carriages that are easily moved from side to side on a heavy-duty track. Movable-lateral systems dramatically increase storage capacity while still permitting immediate access to all storage areas. Movable-lateral systems are exceptionally flexible and can be easily expanded at any time (modular). This type of storage system works well with virtually any type of media/equipment and is especially effective in maximizing storage capacity along walls in narrow rooms or corridors. Would you like to learn how to utilize our movable lateral systems in your office environment? Contact a Franklin Mills systems specialist at 1-888-678-4585.